Last year, Cartoon Network premiered a strange little miniseries from the creators of Adventure Time. It breathed like an old woodcut book from the dark forest of Germany, in the colors of a cold autumn night. Talent raging from Elijah Wood to Christopher Lloyd and John Cleese voiced characters. 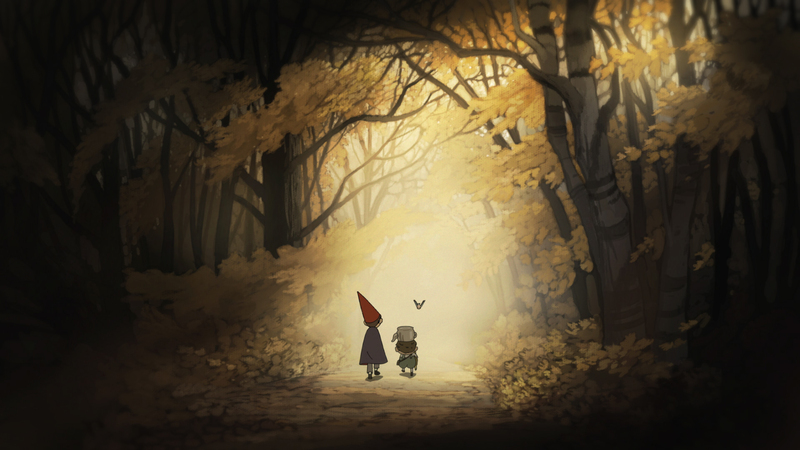 What makes Over the Garden Wall so memorable is the stories weaved with a familiar fairy tale stitch but updated to include surprising twists, interesting female characters, and some really great songs. Greg – the littlest brother – is one of the best kids in a show. He’s weird, but endearing in a way kid characters rarely are. I don’t want to give away too much of the plot, but it begins with Wort (Elijah Wood) and Greg, his much younger brother, lost in the woods. They come across a woodsman (Christopher Lloyd) who warns them about a beast. Throughout all five episodes, you watch the brothers come across a talking bluebird, strange monsters who turn out to be good, and sweet people who turn out to be monsters. And it’s all twisted back together to have you wanting to watch it again. It’s currently replaying on Cartoon Network this week at 8:30/7:30 CST or you can catch it on Hulu+. I recommend throwing a log on the fire, curling up with a hot mug of cider, climbing Over the Garden Wall and keeping the lantern lit. Always keep the lantern lit.